Now, 23 visitors are online. Real transparent anti-intrusion glass (Security glass). Unlike plastics, PVC and resins, glass does not yellow or deform. Screw models supplied drilled + solid stainless steel spacers and stainless steel screws. Models to be placed on granite bases of the same width as the glass for perfect stability. 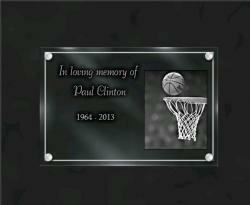 Real engraving carried out in hollow thus inalterable (no laser or printing). Artistic work of portraits with photo-realistic study for agreement before engraving. 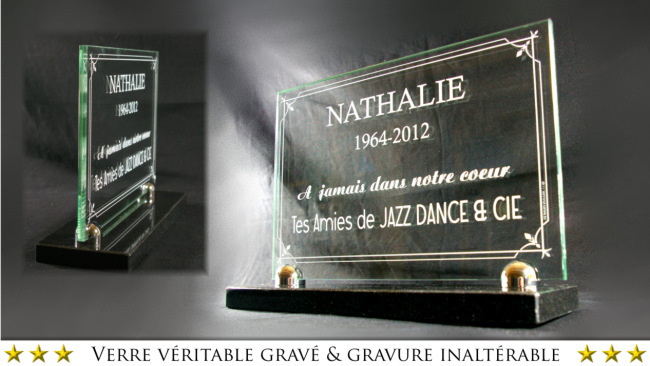 Glass grave plaques, with art engraving. Rating : 9.9 / 10 - 282 reviews collected by Google. 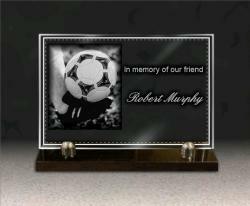 Glass grave plaque with photo of football. Personalized. In loving memory plaques with real glass, engraved in the mass. 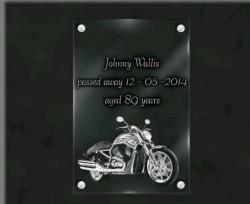 Our engraved glass plaques are very aesthetic and perfectly engraved. 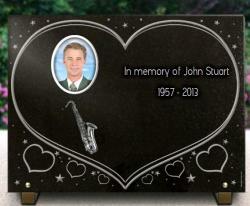 Below, the photo of the deceased is handcrafted by the engraving artist and of an unalterable quality. 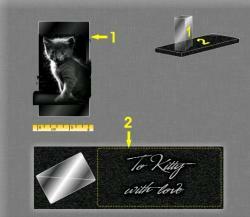 The glass is laminated quality (44/2) and the base is made of 1st choice solid granite. 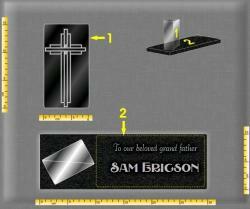 Glass engraving for cemetery plaque, engraved with decorative border. 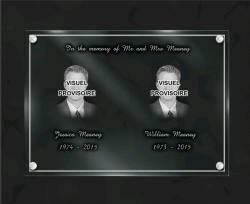 For good visibility, the monument on which you will place your glass plate must be dark. 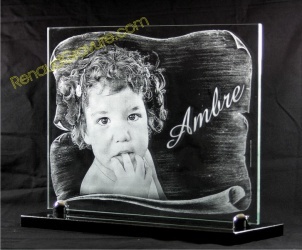 Glass engraving: Perfect resistance and stability at all times. 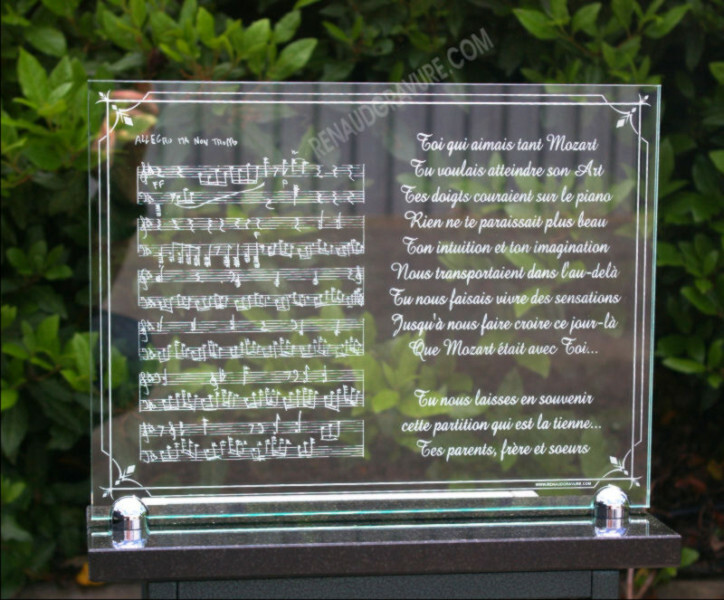 Our engraved glass items are made of burglar-resistant glass (44/2), If the glass is broken, it stays in place and has no sharp and dangerous parts. 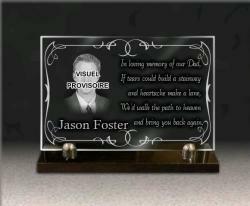 This 9mm thick engraved glass is combined with a 20mm thick granite base. 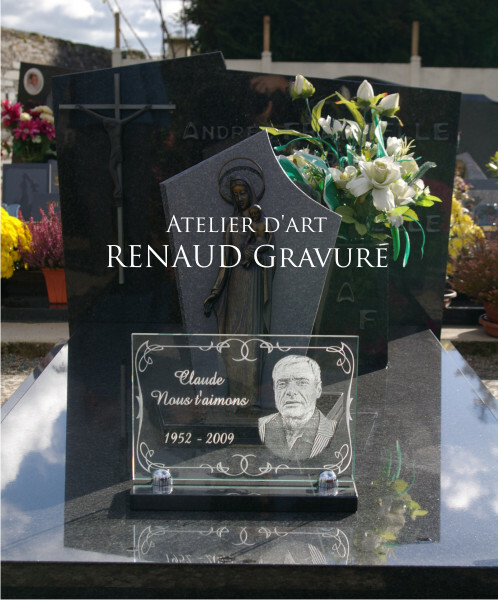 This heavy granite base measures the full width of the glass to protect it from shocks, it has a depth specially calculated to ensure perfect stability of the plate on the funeral monument even in the event of a storm. Only real glass can resist outdoors. There are many PMMA plates on the internet, plexi in "so-called glass": Be careful, it is important to be well informed about the poor quality of plastic plates. Indeed, for the most part, they are acrylic glass objects called "plexiglass" or "PMMA". These products are simply printed in the vast majority of cases. Of course, the production cost is extremely low, but so is the quality. These achievements do not stand the test of time at all. 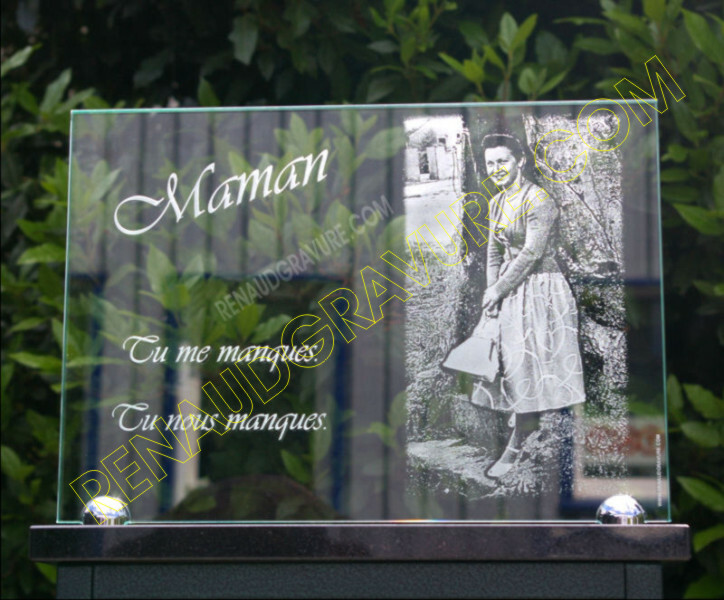 At Renaud Gravure we use real glass, so they are perfectly resistant to external aggressions such as high heat or freezing. The glass does not deteriorate outdoors, however, the glass is not guaranteed against breakage due to impact. In addition, these plates are engraved using a unique sandblasting technique that allows the creation of ultra-fine details that are better engraved than laser engraving. If your monument is clear, the white engraving is not very visible. The engraving being white and the glass transparent, if your monument is clear you will not have a good visibility of the portrait or texts. A solution exists, choose engraved and gilded texts 24 carats. 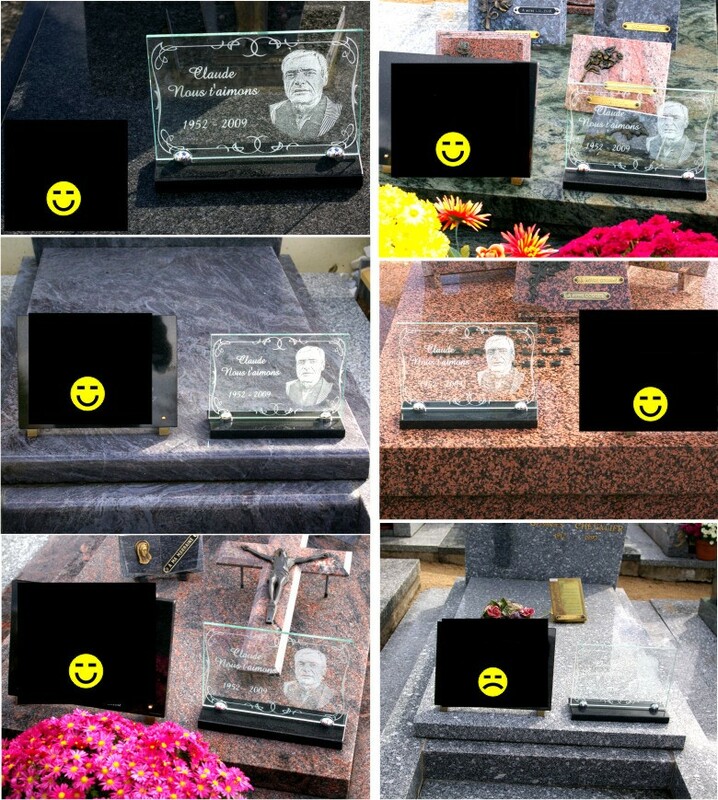 Concerning the portraits, there is no other possibility than to engrave them in white, so we do not recommend glass plates if your monument is clear. 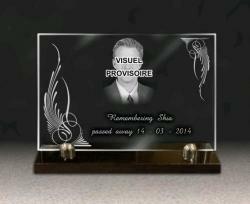 Above: Funerary plate made of real glass engraved in the mass with perfect outdoor resistance. ATTENTION, as qualified professionals: We only offer you resistant plates for outdoor use. So we do not make printed plastic sheets! Above: Reproduction of an old photo engraved in real unalterable anti-break-in glass. 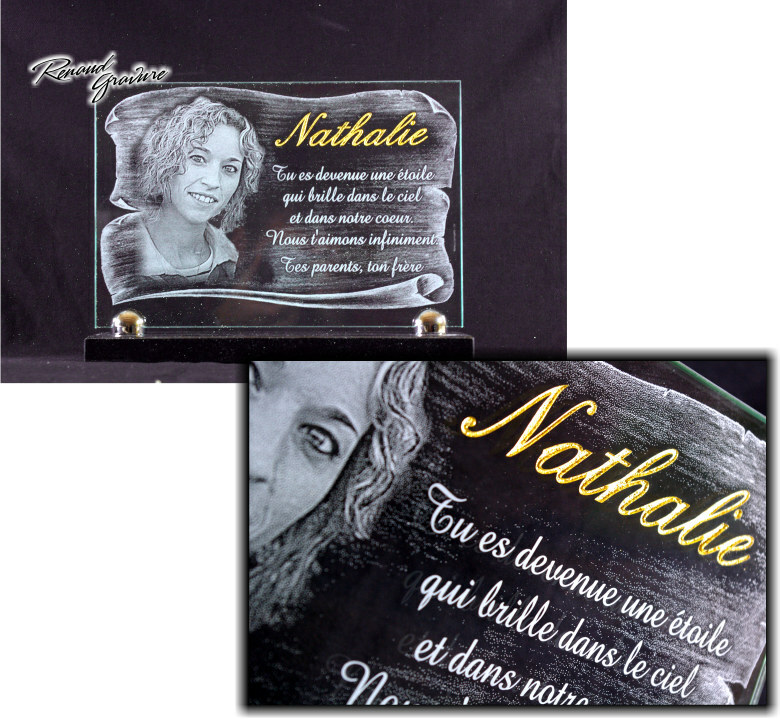 The photo was artistically worked by Jocelyn RENAUD, a graduate engraver artist and rated by Drouot Cotation to give a perfect rendering to the engraving. The engraving is hollowed out, so it is unalterable. Glass is real and anti-burglary glass. 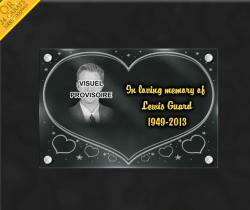 Unlike PVC and other plastic funeral plates, our plates do not yellow, deform or fear frost or high temperatures. Either you look at the models sorted by theme, you choose one and you customize this model. Either click directly on "Create a plate" at the top of this page. We are at your disposal to advise you, do not hesitate! Gold leaf engraving, very good visibility even on a clear monument. Regardless of the colour of the funeral monument, the gold engraved texts and motifs are highly visible. reproduction of a score provided by the customer. This plate measures 40x30cm, it is fixed on a 40x15cm granite base. The whole is of a perfect stability designed for strong winds. For good visibility, the monument on which you will place your glass plate must be dark. 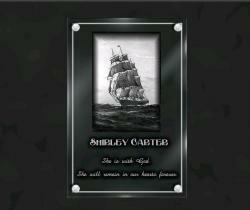 For an original grave plaque: choose engraved glass. 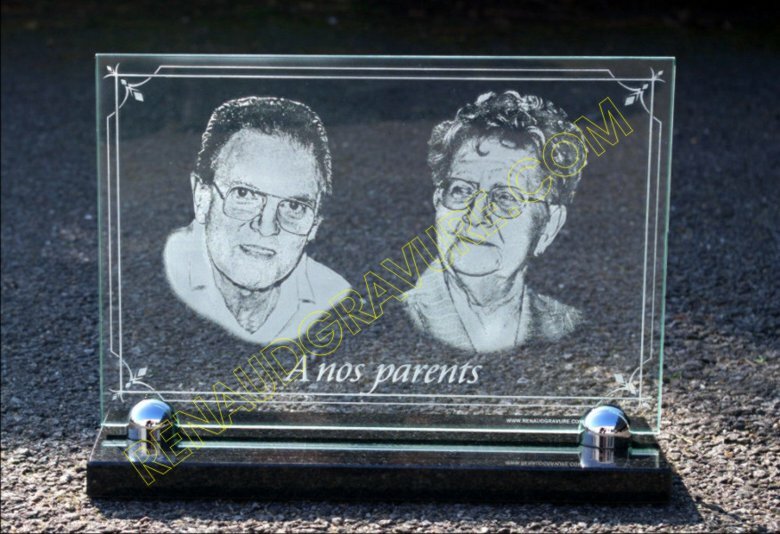 If you wish to offer an original memorial plaque to a loved one who has died, you can choose to have it engraved on glass. These will match all styles, depending on the elements you insert you will obtain a classic or resolutely modern result. 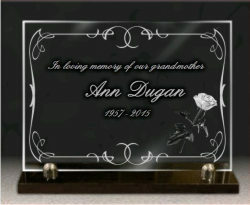 These glass grave plaques are placed on a very heavy granite base which ensures great stability. 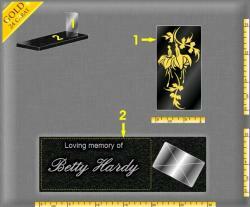 To personalize these plaques, it is possible to have the photo of the deceased or an object or landscape he loved engraved on them. It is also possible to choose patterns from the list provided by the configurator. The engravings obtained by sandblasting are naturally white but it is also possible to gild them. For this purpose, Renaud Gravure uses real 24-carat (1000/1000th) gold leaf, the only one that is totally stainless. These gildings give a more luxurious effect but also make the engravings more visible depending on the colour of the monument on which the plaque will be placed. 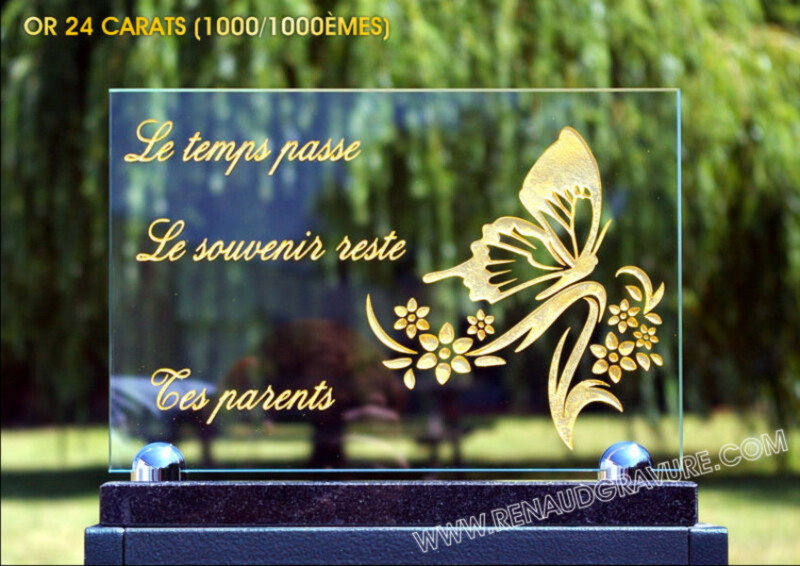 Above: Laminated glass plate (30x20cm) engraved and gilded with 24-carat gold. Very stable granite base 30x10x20mm. Engraving made in relief, unalterable. Manufacture within 10 working days. 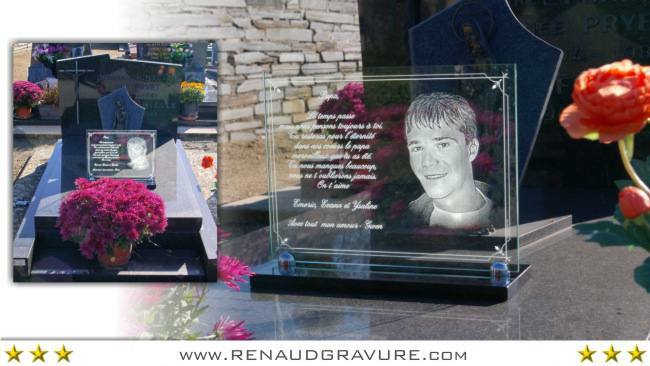 Among all the possibilities at Renaud Gravure, glass plates are particularly suitable for decorating a granite monument. These hand-engraved and fully custom-made plates look great on a dark background. The sandblasting engraving technique used on real glass offers a wide range of grey shades, from darkest to lightest to white. 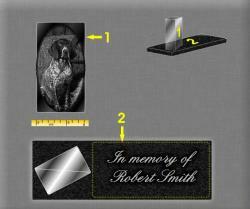 The black granite base that supports the plate will perfectly match the dark monuments. To give a touch of prestige it is possible to affix a gilding made with pure gold, on all the engravings or on only a part to highlight it. Renaud Gravure is the only French company to use 24-carat gold leaf, which guarantees good resistance over the years since pure gold is totally stainless, unlike alloys. These glass items can also be ordered without a base, so that they can be fixed directly to the monument using solid stainless steel fasteners. A work of art in glass engraving for a final tribute..
A professional engraver is above all an artist who uses his hands rather than a machine. It is futile to want to compare a RENAUD Engraving plate with one of other laser-marked, silkscreened or imported from China... These products are so far apart that they are totally incomparable. Photo of a laminated glass body plate with burglar alarm (44/2). Glass memorial plaque set in situation in the cemetery. The engraved glass is rigidly fixed on a base by stainless chrome-plated brass fasteners. The base is made of 1st choice granite of the same width as the real glass plate, due to its weight and large size; it provides perfect stability of the whole, even during storms. A dark monument is recommended because the engraving is light.